Stocks broke above their short-term consolidation on Friday and they got close to the recent local high. The S&P 500 index was the highest since the early October more than a week ago. But then the market traded within a consolidation. Will the uptrend resume today? Intraday trade: The S&P 500 gained 0.7% on Friday, after opening 0.5% higher. 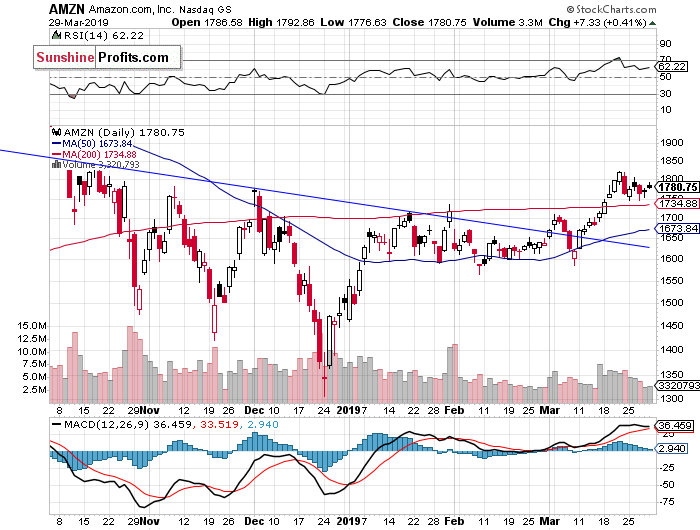 The market will probably open higher again today. We may see an attempt at breaking above the short-term local high. The U.S. stock market indexes gained 0.7-0.8% on Friday, breaking above their week-long consolidation, as investors’ sentiment improved following better-than-expected economic data releases. The S&P 500 index retraced more of its October-December downward correction of 20.2% recently. The broad stock market's gauge traded just around 3% below September the 21st record high of 2,940.91. But then it fell close to the 2,800 mark again. 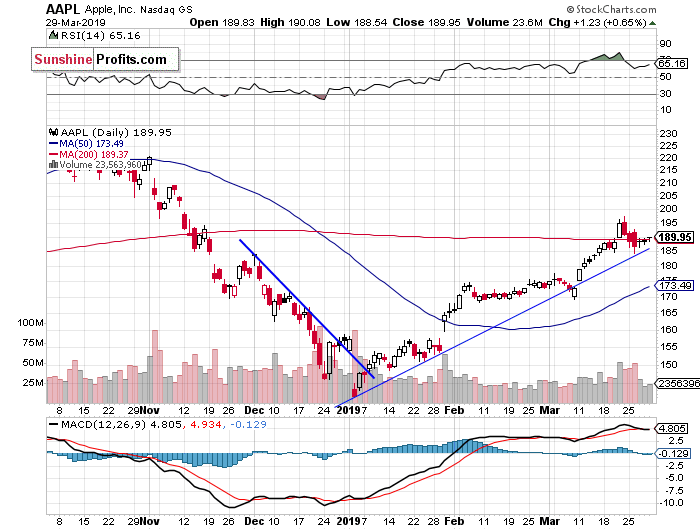 Today, we may see an attempt at extending the medium-term uptrend. 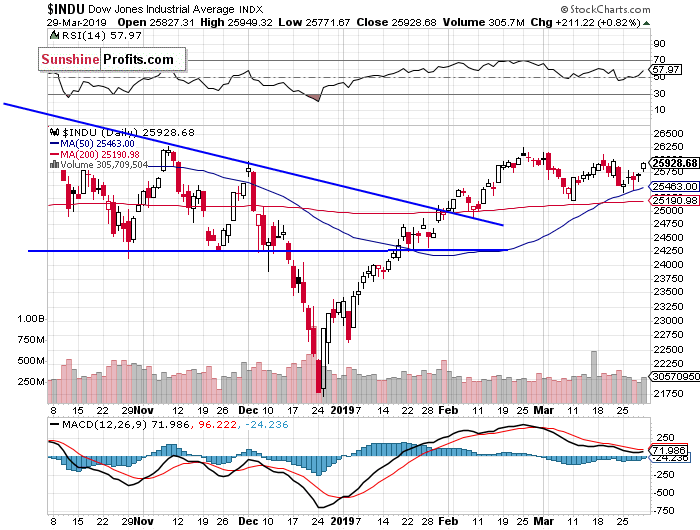 Both the Dow Jones Industrial Average and the Nasdaq Composite gained 0.8% on Friday. 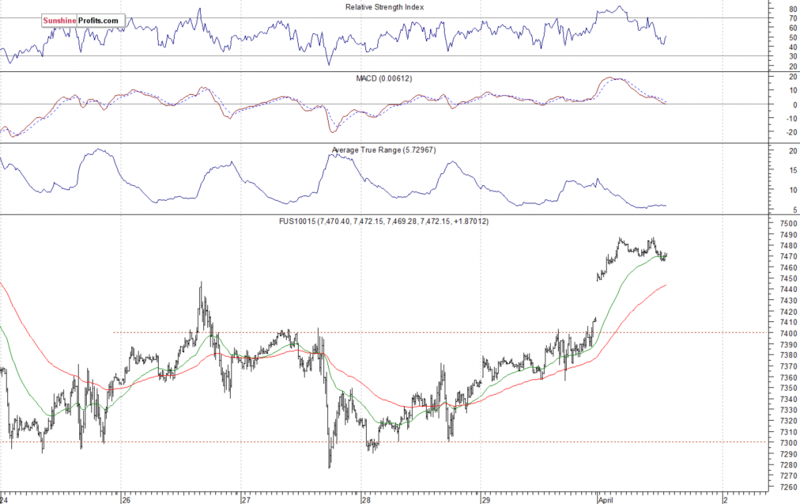 The nearest important resistance level of the S&P 500 index is now at 2,845-2,860, marked by the short-term local highs. The next resistance level is at 2,900. On the other hand, the support level is now at around 2,820, marked by Friday’s daily low. The support level is also at 2,800-2,810, marked by the recent resistance level and the daily gap up of 2,798.32-2,799.78. Expectations before the opening of today's trading session are positive, because the index futures contracts trade 0.7-0.8% above their Friday's closing prices. The European stock market indexes have gained 0.6-0.9% so far. Investors will wait for some important economic data announcements today: Retail Sales at 8:30 a.m., ISM Manufacturing PMI, Business Inventories, Construction Spending at 10:00 a.m. The broad stock market will likely continue its Friday’s rally. We may see an attempt at breaking above the recent local high of around 2,860. 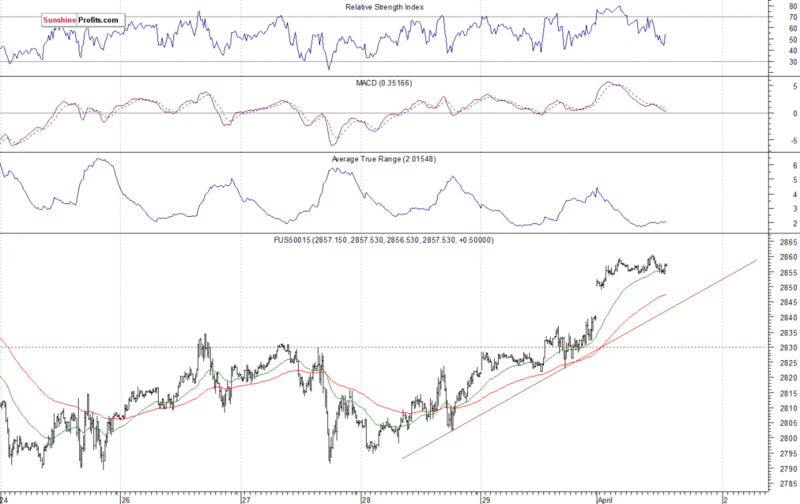 The S&P 500 index extended its short-term uptrend recently, as it got the highest since October the 10th again. 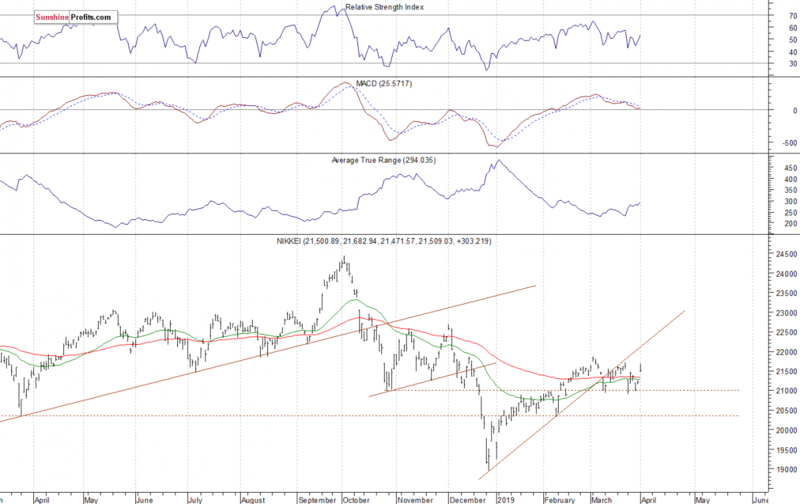 But then the market bounced off the previously broken two-month-long upward trend line. Since then stocks have been going sideways. For now, it looks like a relatively flat correction within a three-month-long uptrend. Concluding, the S&P 500 index will likely open higher today. 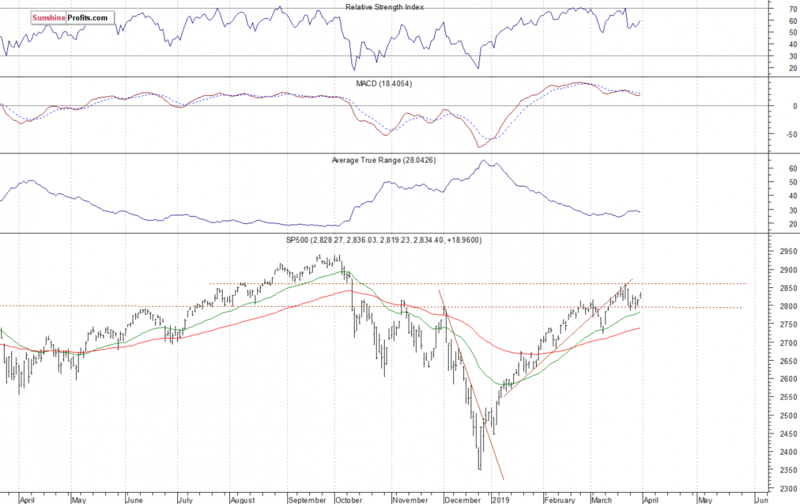 The market may break above its recent local high. But first, investors will wait for the mentioned important economic data announcements.